Renee Thompson lives on five rural acres near Sacramento. Sharing the pasture with her goats is a critter-cam that has recently recorded video of deer, skunks, raccoons, and a prowling fox. Renee’s love of wild things, and her thoughtful and often funny nature, is clear in her posts on her delightful website and also in her writing. Her recently released second novel, The Plume Hunter, is historical fiction, set in Oregon at the end of the 19th century, when elaborate plumes for ladies’ hats were in fashion. Millions of birds were slaughtered for the millinery trade, and Renee’s novel explores both aspects of plume hunting – the hunters, who scoured the marshes, and the naturalists, who foresaw the inevitable extinction of these birds and fought for laws to protect them. This conflict is brought to life in the characters Fin McFaddin, the plume hunter of the title, and his boyhood friend, Aiden Elliott, whose love of nature takes him in quite a different direction. A selection from The Plume Hunter will be read at the 2nd Anniversary Celebration of Stories on Stage. Recently she and Sue Staats discussed the novel, and the historical events that inform it. Renee, what initially inspired you to write The Plume Hunter? 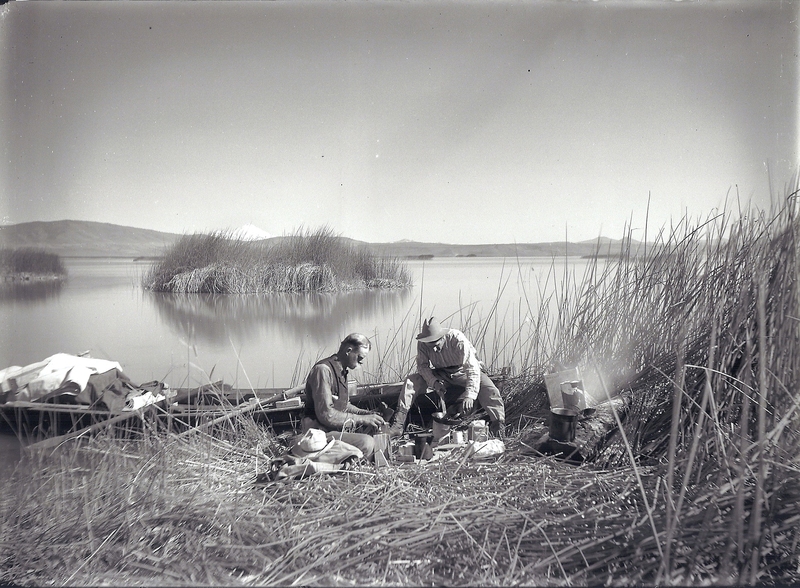 I was reading William Kittredge’s Balancing Water when I came across a photograph of William Finley and Herman Bohlman – Oregon naturalists/photographers – in the marsh of Lower Klamath in 1905. At the same time, I saw another historical photo of market hunters – men who shot ducks for the restaurant trade in Seattle, Portland, and San Francisco. The photos sparked my curiosity, so I did some quick research, and learned that in 1885 over five million birds were killed in the United States alone for the millinery trade, and that plume hunting, while dangerous, was also very lucrative. I knew then I would write a story about two best friends in conflict: one who shoots birds for a living, while the other attempts to save birds through conservation and science. So the two main characters, Fin McFaddin and Aiden Elliott are based on fact? How about the other plume hunters, LeGrande Sharp and Axel Ambrose? Or the man who inspires Aiden Elliott to become a conservationist, Frank Chapman? Fin and Aiden are fictional characters, as are LeGrande and Axel. William Finley and Herman Bohlman did inspire Fin and Aiden’s characterization, and Frank M. Chapman plays himself. Chapman was a banker-turned-ornithologist in the 1880s, then served as the curator of birds for the American Museum of Natural History in New York City. He was also instrumental in the re-formation of the Audubon Society, along with Harriet Hemenway, and others. LeGrande Sharp is quite a nasty character. Was plume hunting really that dangerous and competitive? Yes, it was, in large part because it was very lucrative; in 1903 feathers sold for $32 an ounce, while gold fetched just under $19 per ounce. But because the work was dangerous – one of the first game wardens was killed by a plume hunter in Florida in 1905 – not everyone was willing to participate. How much research and site visiting did you have to do? I spent months researching the plume-hunting trade, learning which birds were shot, and how feathers were collected and sold. I also spent a few days at Oregon State University, in Corvallis, OR, reading about William Finley and Herman Bohlman, and studying their photographs. And then I flew to Washington, DC, where I spent some time in the archives of the Smithsonian, looking at bird “skins” and “scalps.” What’s astonishing, too, is the number of birds that were killed in the name of scientific study. The Smithsonian is loaded with them. 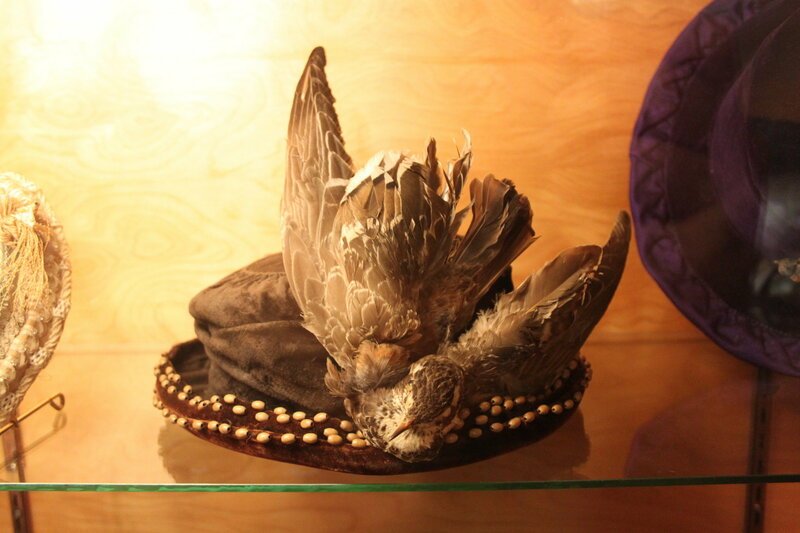 You have a wonderful chapter in The Plume Hunter where women are trying on a variety of hats, each one more fancifully decorated with feathers and entire stuffed birds than the one before. Do you have photographs of these hats you could share with us? Are bird populations of the hunted species mentioned in The Plume Hunter back to what they were? What kind of protection do they have as a result of the work of men such as Aiden Elliott? Some birds, such as the great auk and Carolina parakeet, were lost before my characters began shooting birds, and the last passenger pigeon, Martha, died in the Cincinnati Zoo in 1914. But great egrets, snowy egrets, and western grebes are doing very well, in part because feathered hats eventually fell out of fashion, and because Congress passed the Lacey Act, which made it a federal crime to transport birds killed in violation of state law across state lines – which meant birds killed in Oregon, for example, could no longer be shipped to milliners in New York City. And once Teddy Roosevelt established wildlife refuges in the Malheur and Klamath regions in the early 1900s, the birds began to rebound. Any plans for a novel set in the present day that focuses on an environmental concern? My publisher would love for me to do so! When I was reading Kittredge’s book, I was researching what I thought would be a contemporary story on water wars between Southern Oregon and Northern California, but then I was sidetracked by the idea of the historical piece on plume hunters. For now, I will probably continue to focus on short stories. In The Plume Hunter, even the plume hunters (with the exception of LeGrande) have a favorite bird—one they won’t shoot. I found that detail touching and humanizing, particularly for the character of Axel. I know you’re a bird enthusiast, and I wondered what your favorite bird is? My favorite is the belted kingfisher, the bird Fin regretted shooting as a young boy. What do you hope readers come away with after reading The Plume Hunter? Above all, I hope they enjoy the book. And then I hope they come away with a better understanding of how close we came to decimating so many species of birds, and how valuable the Audubon movement was in educating us about those losses. I hope, too, readers who are unfamiliar with our wildlife-refuge system will become curious about it, and its role in protecting habitat. Sue Staats recently received her MFA in Fiction from Pacific University. She’s currently revising her novella, “The Mitchell Boys,” and working on a collection of linked short stories. Her short story “No Hero, No Sharks” was runner-up for the 2011 Gulf Coast Prize in Fiction, a finalist for the 2011 Reynolds Price Fiction Award, and will be published this spring in The Farallon Review. Her fiction, non-fiction and poetry have also been published numerous times in Susurrus, the literary journal of Sacramento City College. A great interview that really makes one want to read the new book! Hope to make it to the reading 1/27.